I'm always looking for new breakfast ideas. This one is "swirlling" around the blogger world... just thought I would keep it "swirlling!" 1. Combine dry ingredients in a medium size bowl. Combine wet ingredients in a liquid measuring cup and then whisk into flour mixture. Batter should be lumpy and not too thin. In a small bowl, combine ingredients for the cinnamon swirl, and pour into a plastic ziploc bag or a disposable pastry bag. Snip a tiny triangle off the end of the bag for piping. Set aside. 2. Heat a nonstick skillet over medium heat. Grease with butter, if desired, and pour on a 1/2 cup of batter. 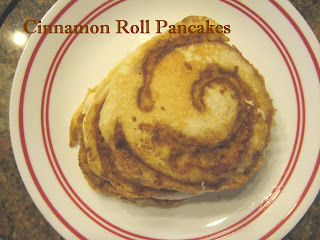 Use the pastry bag to make a swirl of the cinnamon sugar mixture on top of the batter. 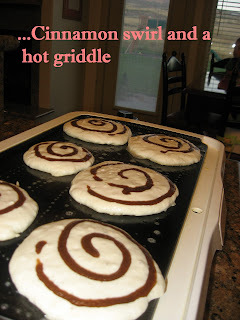 When the bubbles on the surface of the pancake begin to pop, and then no longer fill in with more batter, flip, and cook for 30 seconds more. Repeat with remaining batter. 1. In a medium sauce pan, combine butter, sugar, and buttermilk. Set over medium heat and bring to a boil. Reduce heat to low and allow to simmer for 10 minutes, stirring occassionally. Take off heat and stir in vanilla and baking soda. Stir, and the mixture will become thick and bubbly. 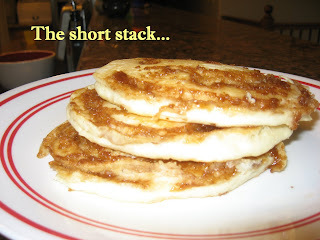 **These might be yummy pumpkin pancakes for the fall season.... with cider syrup! YUM! We have a General Conference tradition of cinnamon rolls for breakfast. I may just have to make this instead!